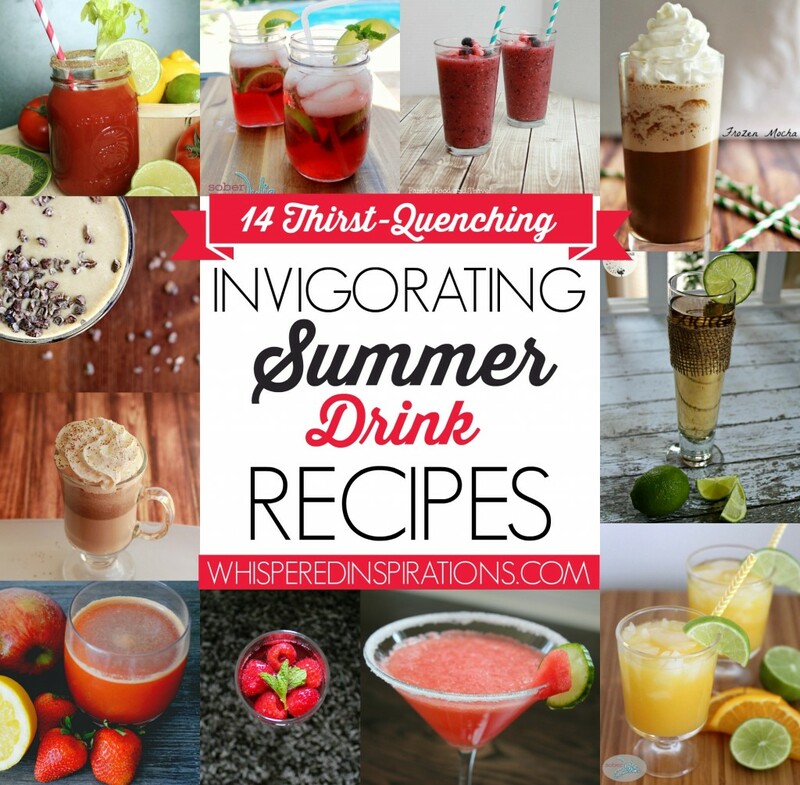 Check out 14 Thirst-Quenching Summer Drink Recipes! Yes folks, summer is truly here and just as we had a long, bone-chilling, colder than usual winter–this summer is BLAZIN‘. That only means that we simply have to be tolerant of the weather and find creative ways to stay cool. Who says that those ways can’t be tasty too? I am a SodaStream Ambassador and with that, it has expanded my love for a good drink that not only refreshes and cools but, comforts you too. I’ve rounded up quite a few amazing recipes from fellow bloggers who share the same love of tasty drinks. You will find mocktails, cocktails, smoothies, iced coffees and of course, my SodaStream favorites! You can try my Cranberry Raspberry Mint Spritzer and an easy Lime Ginger Ale! Berry and Citrus Whole Fruit Slushie. 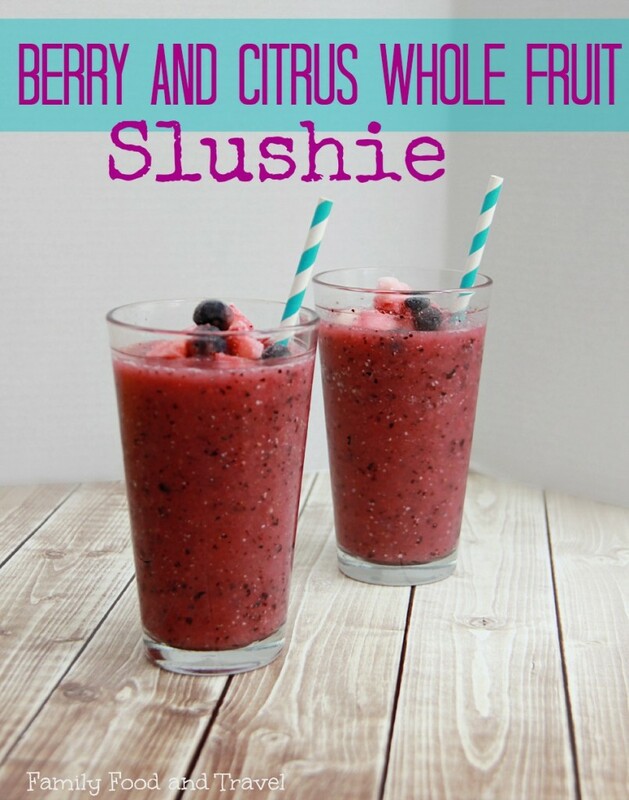 My bloggy friend Kerrie from Family Food and Travel created this delicious Berry and Citrus Slushie for her boys. That way they can get the fun out of drinking a slushie but, get antioxidants, hemp hearts and citrus! Delicious and nutritious, plus–add a little 7UP or vodka and you can play too. 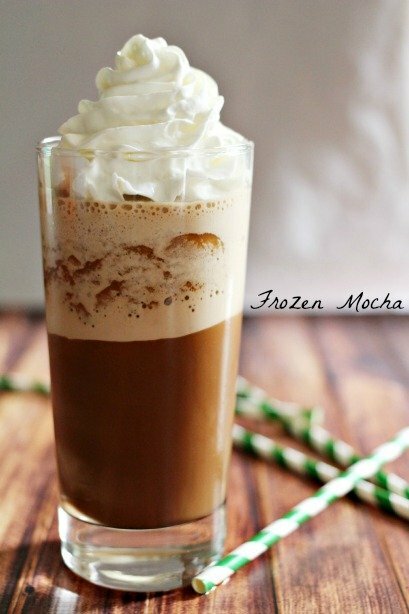 This delicious frozen mocha made by my bloggy friend Elizabeth from Frugal Momeh. It is delicious and ingeniously made with frozen coffee. I love how that not only will it cool you down but, it will give you the boost that you need to get through the day. You have to go check out the rest of her Frozen Mocha recipe, here. Skip the Booze, Bring On the Mocktail! I am not much of a drinker. In fact, these days, one drink may get me a little tipsy. Okay, maybe not but, I much rather have a great mocktail. My awesome bloggy friend Julie from Sober Julie always has a great drink up her sleeve. 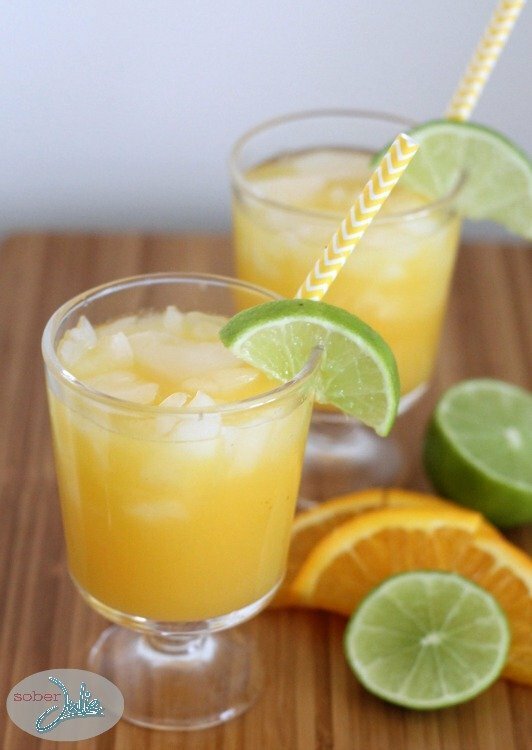 Here’s a favorite Fuzzy Navel, sans le liqueur. Heck, even the gents can jump on this one! This is one of my favorite drinks that I make with my SodaStream. 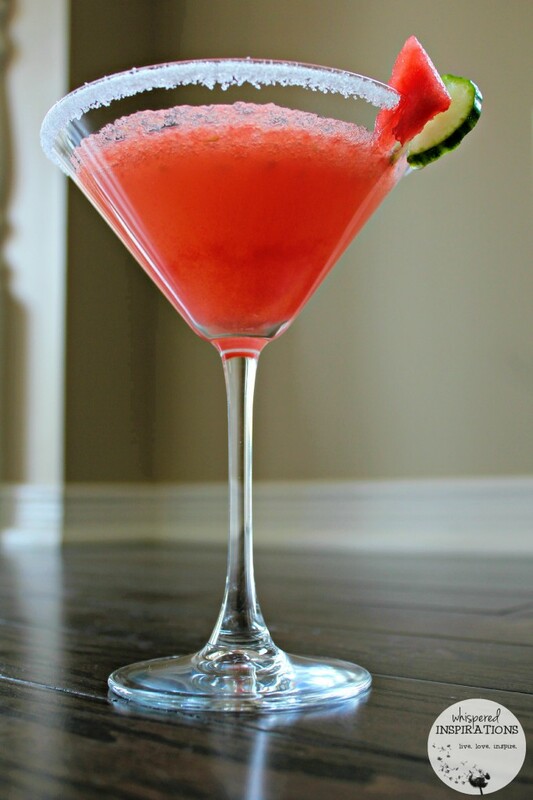 Made with fresh watermelon and cucumber puree and super bubbly Orange Grapefruit Sport mix. It is fortified with Vitamin C and this will give you a nice boost anytime. So refreshing and the stevia rim adds a punch of sweetness! You’ll be asking for a MOMosa every weekend once you try it! Make sure you head over to Foodie.com to check out the rest of the delicious and refreshing drinks in my collection, HERE. You’ll soon be on your way to making amazing drinks this summer. Stay cool, stay hydrated and enjoy life! Note: This post is sponsored by Foodie.com. All thoughts and opinions are my own and have not been influenced in any way. Can I just get one of all and call it a great day? From berries to mochas, I love summer for all the delicious drinks – thanks for all the new great recipe ideas! These look great! I can't wait to try the Berry and Citrus Slushie. I knowmy hubby will LOVE the frozen mocha!! All of these drinks should be in front of me right now. I want to try all of them. Thanks for sharing. Those each look like great recipes! I want to try that berry one. Wow, I am super hot right now, and these all look so good. Would I go with a creamy one or a strawberry? Decisions! I love mocktails in the summer… they are light and refreshing! That frozen mocha sounds absolutely amazing right now. it is so hot here. Mmm! These all looked delicious! Thanks for sharing! I'll take a frozen mocha please. Actually, make that one of everything. yes, please… I would like one of each… Especially the mocha! Sounds delicious!!! Your drinks are amazing. I am such a Coffee drinker but I would love to try them all. Thank you for sharing. The frozen mocha would be perfect for you! I"m all about those fruit smoothy drinks! Bring on the fresh fruit in delicious drinks! Yum! I love summer drinks. These look good to add to my list! They all look and sound great! That slushie looks especially tasty! I know, the slushie looks so refreshing! I am all about a mocktail! Really though, I love ice. I never thought to use my SodaStream in an out of the box way. These are super ideas! What a wonderful collection of drinks. I'm pinning it for summer entertaining ideas. Thank you for including my Coke Float, Berry Whole Fruit Slushie and Frozen Hot Chocolate! My pleasure, they are on my list of trying at least one every weekend. Delicious. Thanks for allowing me to share! The watermelon and grapefruit drink looks so yummy! I'd love this combo! These are all so great! I could easily get hooked on the frozen mocha, YUM!!! The frozen mocha is my fav, thanks for the share, cheers! Who doesn’t love a tasty slushie! Totally making some today with my girl, thanks for the Sunday inspiration! I will be testing a few of these over the Holidays!